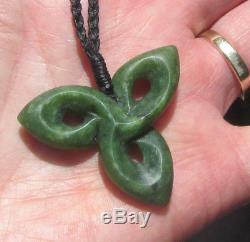 ONE OF KIND GEM GRADE NZ MAORI POUNAMU GREENSTONE JADE KOROUA TREFOIL PENDANT. 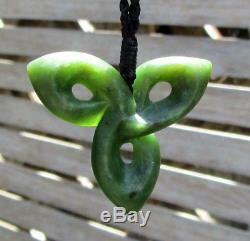 STUNNING AND EXPERTLY CARVED GEM GRADE MARSDEN NZ GREENSTONE JADE MAORI KOROUA TREFOIL PENDANT - FABULOUS SHADES OF EMERALD GREEN. Hand carved by ESZTER, this completely one of kind piece is perfectly finished with a tactile, satin glow and measures 1.4" by 1.7" with a three dimensional sculptural depth. It's bound onto a strong hand braided adjustable black cord. IT COMES WITH MY CERTIFICATE OF AUTHENTICITY. The carvings I offer are priced incredibly reasonably for genuine artist carved NZ POUNAMU which will soon become impossible to obtain. All my pendants are blessed in the Maori tradition. All my photos are taken outside in natural light - no digital enhancement - no photoshopping - what you see is what you get! 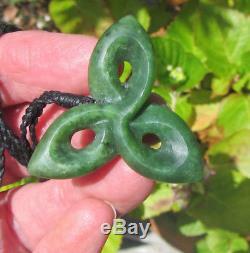 Pounamu is found only in the South Island of New Zealand. Because of this, the island was originally named Te Whi Pounamu (the place of pounamu), but over time this name changed to Te Wai Pounamu (the greenstone waters). 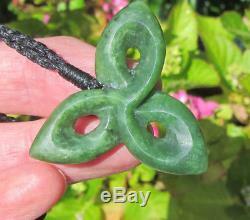 No other jade should be classified as pounamu as it is a Maori name for the stone. There are ten main types of pounamu. Arahura - a dark velvet green. Inanga - pale blue or green - can be opaque or translucent. Totoweka - a rare type - streaked or spotted with red. Kahotea - dark green with darker inclusions. Tangiwai - bowenite - found only in certain areas of Aotearoa NZ - dark blue/green - exceptional translucence. The main deposits used by Mori are in the districts around the Taramakau and Arahura rivers in Westland, coastal south Westland and the Lake Wakatipu area in Otago. In addition, there is a significant field of bowenite in Milford Sound (Piopiotahi). Traditionally, the pounamu in the Arahura River has been most important for Poutini Ngi Tahu (Ngi Tahu people on the West Coast), with the junction of this river and Waitaiki (Olderog) Stream being particularly important. Authentic Pounamu Jade + Bone Carvings from Aotearoa New Zealand, the land of the Maori people and the inspiring scenery you saw in Lord of the Rings! All other buyers may choose this option if required. Because of this, the island was originally named Te Wāhi Pounamu (the place of pounamu), but over time this name changed to Te Wai Pounamu (the greenstone waters). There are ten main types of pounamu: ---Arahura - a dark velvet green ---Inanga - pale blue or green - can be opaque or translucent ---Totoweka - a rare type - streaked or spotted with red ---Kahotea - dark green with darker inclusions ---Kawakawa - rich leaf green sometimes with dark freckling ---Kohuwai - a misty grey blue with vivid bright green - like moss in a stream. --Kokopu - sometimes called troutstone - silver or golden green with brown freckling ---Kahurangi - emerald clear green sometimes with white feathering - highly prized ---Raukaraka - called Flower Jade - varied greens with gold/orange blooms ---Tangiwai - bowenite - found only in certain areas of Aotearoa NZ - dark blue/green - exceptional translucence. New Zealand gold The main deposits used by Māori are in the districts around the Taramakau and Arahura rivers in Westland, coastal south Westland and the Lake Wakatipu area in Otago. Traditionally, the pounamu in the Arahura River has been most important for Poutini Ngāi Tahu (Ngāi Tahu people on the West Coast), with the junction of this river and Waitaiki (Olderog) Stream being particularly important. The item "ONE OF KIND GEM GRADE NZ MAORI POUNAMU GREENSTONE JADE KOROUA TREFOIL PENDANT" is in sale since Thursday, December 7, 2017. This item is in the category "Collectibles\Cultures & Ethnicities\Pacific Islands".